Add all the ingredients into a blender or small food processor and blend until smooth and the oil has incorporated with the soy milk. Find a small stainless steel bowl that rests on the lip of a small sauce pan with a lid. Put about an inch of water in the bottom of the pot, cover, and bring to a boil. Add the mayonnaise mixture into the bowl and when the water comes to a boil, turn down the heat to low, remove the lid and carefully place the bowl in the saucepan. 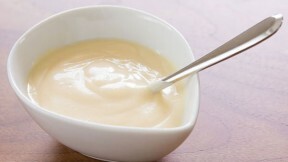 Heat, stirring constantly until an instant read thermometer inserted into the mayonnaise reads 149 degrees F (65C). It should wobble like a loose custard but shouldn't be runny. Immediately remove the bowl from the double boiler and place it in a water bath to stop the cooking. Store your mayonnaise in an air-tight container. Note: If you have a high speed blender such as a Vitamix, Blendtec, or some stick blenders you can omit the tapioca and skip the heating step as this mayo will set in the blender. If you're unsure, you can try blending it without the tapioca first and if it fails to set, add it in at the end and then heat it to set.